IWDG have just received and validated a sighting this morning by Andrew Morgans of a solitary "dolphin" off the Nimmo's Pier area of Galway docks at 08:45am on Jan. 28th. Given the location and circumstances, we are confident this is another sighting of the adult bottlenose dolphin known locally as "Nimmo", and a welcome 1st record of this individual in 2019. Today's sighting brings to five, the number of consecutive years that IWDG has tracked this individual in the inner Galway Bay area and specifically around Nimmo's pier. He/she first came to our attention in 2015, and has been recorded by IWDG on 82 dates since, over the past 5 years. Similar perhaps to our humpback whales along the Southwest, the data suggests that "Nimmo" is appearing earlier most years, as the dates of 1st sighting reports are: 6th April 2015, 21st Feb. 2016, 12th Feb. 2017, 18th Feb. 2018 and 28th Jan 2019. It's also interesting to take a look at the number and span of sightings year on year (below) which tells us that not only is he/she arriving earlier most years, but also staying longer. While this could be an artefact of increased awareness of its presence and more people reporting to IWDG, the data however leans more heavily towards this area becoming more important core feeding habitat for Nimmo. 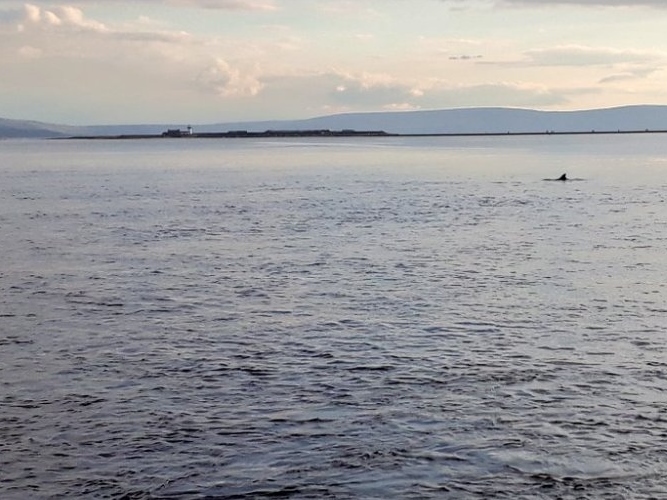 This is a wonderful opportunity for people in Galway to observe a wild dolphin so close to a city centre and often within clear view of the shoreline, where powerful optics may not even be necessary to see him/her. So it will be very interesting to see how Nimmo get's on this year and how long he/she will remain in the area, if at all. Of course we'd ask people to report any sightings of him over the coming months on www.iwdg.ie for validation, and not to assume that because we may know he's in the general area, that we are no longer interested in daily sightings...WE ARE! It is your daily reports that help us build the bigger picture. ENJOY. Image right: Nimmo with Mutton Island in background by Rory Mc Avinney, National Aquarium and front image by Andrew Morgans.